Dr. Francois Ngoumape, who directs biblical and theological education for Grace Brethren interests in the Central African Republic, sends along this photo, update, and prayer request for those graduating from the seminary in Bangui this coming week. “Balao from Bangui, where the weather is unusual in May, the temperature still being high and no rain. I planted peanuts a month ago, but now the leaves are dry. “I want to thank you for your prayers for our students that are writing their theses. 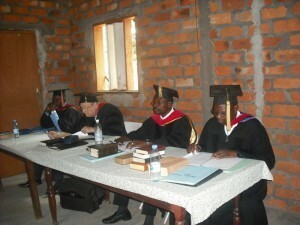 Praise God, the week of May 17-18 was busy for them with the oral defense of their Master theses. We were so thankful for the success, people learning about what they do, and the importance of the subjects they write on, that it will be very helpful to our churches and our ministry in the African context. “We are very thankful for Dr. Eddie Mensinger (second from left in photo) that was here to teach in the seminary and participate as jury of the oral defense. Do pray for the graduation of 16 students from the seminary on May 29. Dr. Eddie Mensinger is the special guest to speak at the commencement.